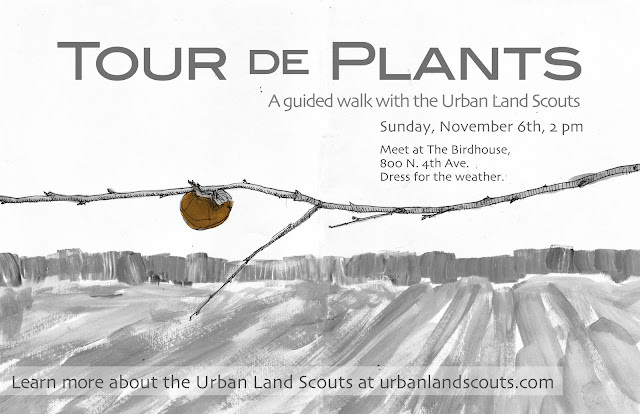 If you live in or near Knoxville, I want to invite you to join us for TOUR de PLANTS, a guided walking tour and introduction to Urban Land Scouts. We'll be meeting up on Sunday, November 6th at 2 pm in front of the Birdhouse, 800 N. 4th Ave. Hope to see you there. 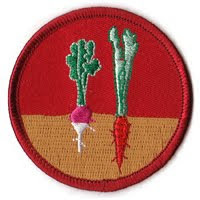 On November 11th some time after 8 pm, I'll be presenting about the Urban Land Scouts for PechaKucha Night at Relix Variety Theatre (on N. Central St). PechaKucha originated in Japan "as an event for young designers to meet, network, and show their work in public" and has caught on in the US. I think of it like a speed-dating format for TED-talk-esque presentations. Each presenter may display 20 slides for 20 seconds each. That means you've got to say your piece in a little over six minutes. Great! I don't yet know all the other presenters, but I'm looking forward to their pieces and to the event. If you live in or near Knoxville, I invite you to join us on 11-11-11 at Relix. I've been working today to mail a letter to all the donors and other supports who helped make the camps this summer possible. If you'd like to read a copy of the letter you can find it here.